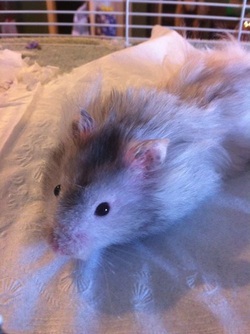 Unfortunately, my old hamster Rocky passed away last Friday on 9/11/14. He had a condition called "rectal prolapse". I got him on 7/5/13, so he lived to be 1 year 2 months. I got him from Pet-Smart, and he was a Dove colored Roan long-haired Syrian. His favorite thing in his cage was his Silent Spinner. R.I.P. I do plan to get another hamster in the future, and I may start a youtube channel about hamsters in the future so stay tuned. How to Keep your Hamster Cool. Hamsters should be kept in an environment that is around 60 - 70 degrees F.
1. Keep them in a air conditioned room or a cool room with a fan, but never point a fan directly at a hamster. 2. Give lots of fresh, cold, water because they will most likely die of dehydration. 3. Give your hamster a small treat from the fridge such as cucumber or Romaine Lettuce. 4. Place a ceramic cup or plate in the cage for a shady spot because ceramic stays cool, you can also put it in the fridge or freezer. A rock will work as well. 5. Lean an ice pack on the sleeping area of the cage, do not actually place an ice pack in the cage. 6. Use a dog or cat cool pad and put it under the cage. Hamsters are usually described as fast, squirmy, and escape artists, but some hamsters just sit there and let you pet them. I only know of two calmer hamsters. 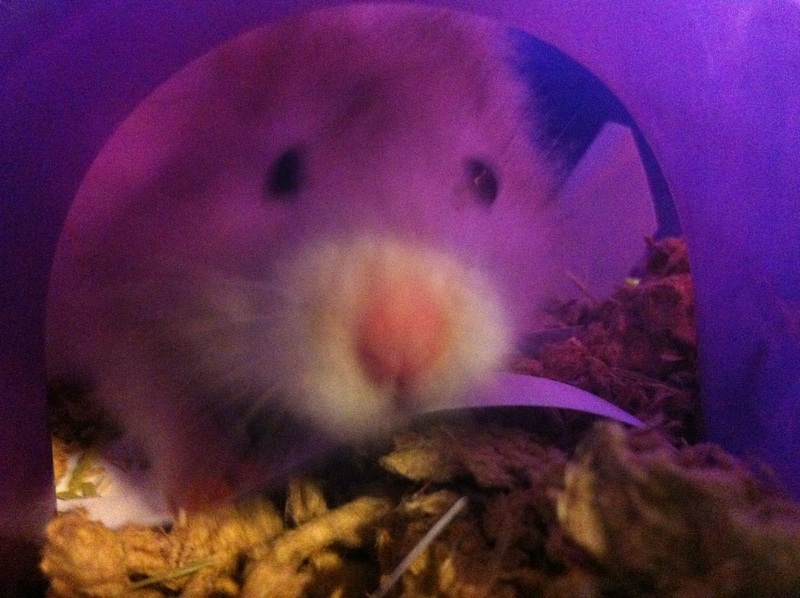 The first one is a hamster named Stinky who could be put on the ground and not run away. The second is Rocky who if you sit him on your lap either sits there or crawls back into his cage. 2. Place your hamster's cage on the floor open with fresh food water and a treat. 4. Hamster proof the room, remove any electrical things, toxic things, and block things your hamster could get under. 6. Make a hamster trap, take a bow and use books as steps into the box, fill it with bedding, food, and water. 7. Dust flour over the room to track your hamster. The only special care long haired Syrian hamsters need is that they may get bedding stuck in thier fur and sometimes it can be soiled bedding. You need a small comb to remove any bedding. Be gentle, hamsters can be injured easily. If they get knots in thier fur do not comb through it remove the comb. You should alos use a fine tooth brush to check for any bugs. Brush through your hamster's fur, then rub the comb on a peice of white paper, if you see small black specks your hamster may have mites. They will also itch a lot and experience fur loss. 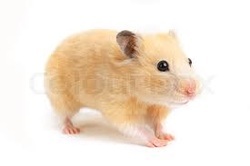 Syrian hamsters are the largest breed of hamster making them the easiest to handle and play with. Most Syrian hamsters have a deep bond with their owner, some say more than any other breed. They live around 1-2 years and they come in different colors and patterns. They can be long haired or short haired. They are nocturnal and also omnivores. They need a good diet to maintain good health. You need a cage minimum of 360 sq inches. The bigger the better. Make sure your hamster cannot escape his or her cage. You can find good cages at most local pet stores or you can build your own. Don't use ones with screen at the bottom because their feet can get stuck. Hamsters need a good food blend to stay healthy, you can buy pellets or seed mixes, both are good although some say seed mixes allow hamsters to pick out fatty foods and leave the healthy ones. Use a ceramic food dish so they can't flip it over and change food daily. Also add fresh fruits and veggies once a week for a healthy diet. Make sure they are safe first. 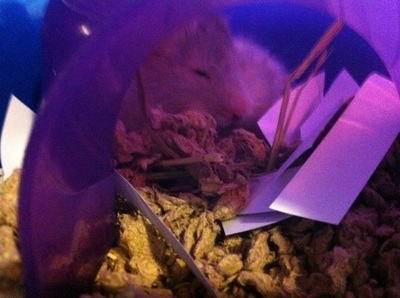 Care fresh or Critter Care bedding is highly recommended to use for your hamster although you can use aspen wood chips. Never use cedar or pine because those can be deadly to your hamster. they need 3-4 inches of bedding to burrow. A hamster wheel is a must, but don't use ones with slats or holes in the bottom because your hamster could get his foot stuck. You can buy a silent wheel but it must be at least 7 inches or more for a Syrian. Also you need chew toys, wooden sticks will work as long as the wood is safe and not treated with chemicals. You can buy salt licks and other chews at the pet store. 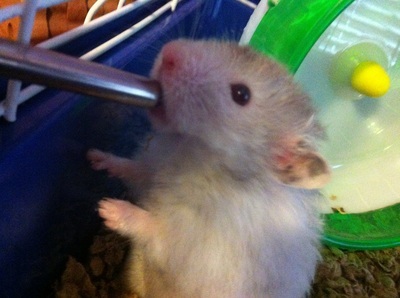 You can buy a water bottle that attaches to the cage as long as it does not leak and that your hamster can reach it. Change water out frequently to prevent it from getting nasty. Use treats to train your hamster, and to get him to like you because the best way to his heart is his stomach. I think yogurt ones work best but feed in moderation. You can buy nesting material but they can wrap around hamster's limbs so I give mine some toilet paper they can shred. you can buy hamster platforms and a cage with tubes but hamsters don't climb in the wild and they might chew or get stuck in a tube, especially Syrians. You can buy or build playpens too, or just line your bathtub with towels and put your hamster in there (no water). You can also buy a hamster ball but make sure it is big enough and that your hamster goes potty before using it. You can also use sand baths because you can never get your hamster wet. You can probably find all of this stuff at a local pet store. I get most of mine from pet smart. My male Syrians seem more outgoing then my girls, but that just may be me. The initial cost will be around 75 - 150 depends on what you buy but after that you need food, bedding and toys monthly, so around 20. You need to clean a hamsters cage weekly with soap and water so you might want a hamster ball but you can just build or buy a play pen.